If you look at the AdWords accounts of small and medium-sized businesses, most of them are in a state of disaster. The primary reason that so many SMBs fail at PPC? It’s simple: They don’t spend enough time in their accounts. We’ve evaluated thousands of paid search accounts, and we’ve discovered a strong correlation between account activity and performance – advertisers who make time on a regular basis to do active work in their accounts almost always see better results. But don’t panic! We know you’re short on time. The reality is, you don’t have to spend days or even hours per week working on PPC to make a difference. We’re here to tell you that you can make a real impact on performance in just 20 minutes per week. Really. The key here is to base bid changes on keyword performance – raise bids on keywords that are performing well, and lower bids on keywords that aren’t making the grade. Remember, there’s no real reason to limit budget on keywords that are delivering ROI. In addition, remember that PPC bid management isn’t a one-time task – you’ll need to optimize bids on a regular basis, because keyword performance can improve or degrade over time due to factors outside your control. Look for keyword outliers with below average ROI and/or Quality Scores – these are the terms that are costing you money and hurting your results. By pausing those keywords, you can stop the damage. 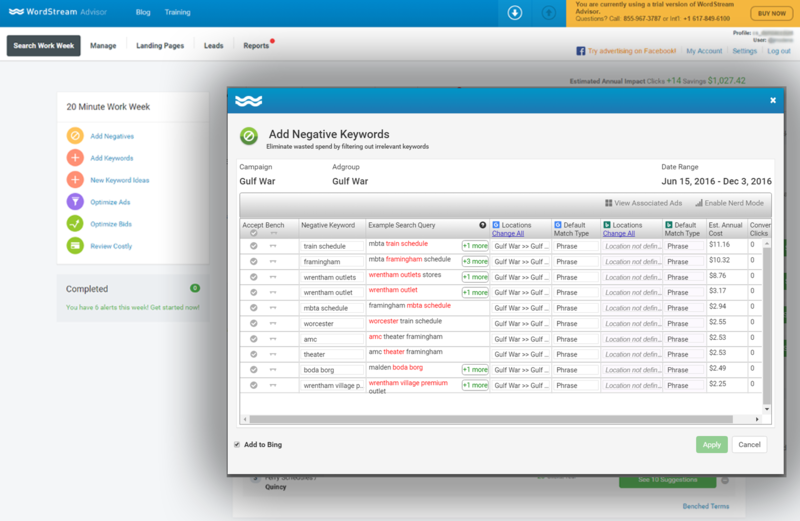 Then, as time permits, you can work on optimizing those keywords or simply dumping them from your account. WordStream’s Pause Keyword Alerts give you an automatic notification when there’s a poorly performance keyword that needs your attention. Just click “Fix” to pause the keyword, then move on to your next alert. You can do all this and more with WordStream’s keyword tools. Throw out your worst two text ads and replace them with new ad text. Doing this every week will net you higher click-through rates and Quality Scores over time. You can also use this time to try out new ad extensions, which can further boost your CTR. Avoid ad group bloat. Split your largest ad group into two smaller, more targeted groups. Create a new, more targeted landing page. Too few landing pages is a sure way to water down your relevance. Set a goal to develop at least one more targeted ad group or landing page offer every month. You’re almost there! The last thing you need to accomplish before you can move on to the rest of your job is reporting. This is actually the fun part – if you’ve been following the 20-minute work week, your results are improving, and you can brag to your boss or your client. 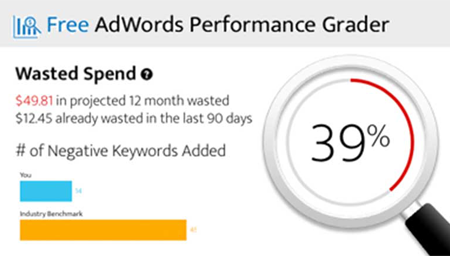 WordStream's PPC Success Report gives you month over month account performance in an infographic-like format. No more confusing spreadsheets or pivot tables. Show off your progress, and set goals for next month. We admit, the above workflow would be difficult to complete in just 20 minutes in AdWords alone. PPC isn’t easy, and that’s why you need the right tools to help you along. Savings Alerts – Weekly automatic alerts tell you exactly how you can save money now. Optimize Keyword Bids – Get tips when it's time to raise or lower your bids for maximum ROI. Pause Keyword Alerts – Seek out and destroy underperforming keywords in your account. Optimize Ads – Writer killer ads as fast as possible and avoid common ad writing pitfalls. QueryStream – Take immediate action on your search query report. Performance Reporting – Click-of-a-button reporting that visually showcases month-over-month performance trends and results. We’re here to help you every step of the way. Want to try it out for yourself? Sign up for a free trial now.